There are four common types of cockroaches found in the Shenandoah Valley of Virginia and Augusta county; American cockroach, brown banded cockroach, oriental cockroach and the German cockroach. Cockroaches can pose a serious health risks to your family or business. Good sanitation and habitat reduction is the key to effective roach control. Also important when treating for cockroaches is baiting and monitoring to assure they stay gone, especially in environments that attract roaches such as commercial kitchens or damp basements. Because most cockroaches are nocturnal and experts at hiding, a successful roach treatment requires special equipment, materials and expertise in identifying which cockroach you are dealing with. If you live in Waynesboro, Staunton, Fishersville or anywhere in Augusta or Rockbridge County, call today for a free inspection and quote. The American cockroach is commonly found in or near food preparation areas as well as warm, damp places such as sewers and basements. They like to be close to water sources such as sweaty pipes and drains. American cockroaches are very aggressive, making control difficult. Although they are most active in temperatures around 70 degrees or higher, they can survive lower temperatures. Cockroaches pose serious health risks to families and businesses. Sanitation and reduction of habitat is very important to effectively control the American cockroach. Brown Exterminating utilizes an Integrated Pest Management program to identify, bait and monitor roaches. This along with pest environment reduction and sanitation guidelines will greatly reduce or eliminate an American cockroach population. German cockroaches can be found almost anywhere but strive in warm and humid environments. Roach control for the German cockroach should focus on kitchens and bathrooms because they usually have the environment they prefer. A German cockroach will spends about 80% of its time hiding in cracks and voids near a source of food or water or both. These cockroaches most commonly enter buildings by riding along on paper products, such as drink carton or paper grocery bags, that have been stored in a place infested by German cockroaches. Cockroaches can pose a serious health risk to your family or business. To control German cockroaches it will take expertise and persistence due to their rapid reproductive rate and wide liveable environment. 95% or more of a German cockroach population needs to be eliminated in the initial treatment in order to successfully keep your home free of these pests. Brown exterminating uses baits and sometimes pesticide powders in cracks and crevices to eliminate German cockroach populations. Finding the source or sources for their harborage is key along with persistent monitoring. Brown banded cockroaches like German cockroaches, are found in kitchens and bathrooms. The main difference of the two species is that the brown banded cockroach requires less water and can be found in many more areas of a home. They can be found in behind electronics, in closets, living rooms and in furniture. This is possible, along with low water needs, as they are omnivores and eat anything organic. This makes them difficult to control. For the brown banded cockroach prevention is worth a mountain of cure. Keeping them out in the first place is critical. This can be done by inspecting anything coming into your home that may have them tagging along such as food goods, used furniture and boxes. If furniture or appliances are suspect to harboring brown banded roaches or their eggs you should vacuum and clean them to make sure you are not bringing in the unwanted home invaders. In your homes, store paper bags away from the utility room, kitchen and bathrooms, which are all great environments for the brown banded cockroach. Sealing spaces and openings around pipes under sinks and behind toilets is helpful to prevent roaches from distributing freely through your home. Sewers and storm culverts are the more common environment for the oriental cockroach but will enter buildings through floor drains. It survives quite well outdoors in harborage such as firewood, leafs, doghouses and similar environments. Cold weather drives them to find warmer inhabitants and it is usually the closest home. They will be first be noticed in basements or cellars but could, with larger populations, be seen closer to living quarters where they are certainly unwanted. A key determining factor in ridding your house or business of cockroaches is to have them properly identified so a treatment and monitoring plan can begin. 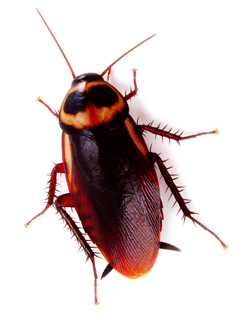 The oriental cockroach typically stay hidden in damp crawl spaces or basement floor drains. Cockroaches in general pose serious health risks. Call Brown Exterminating today for a free quote. We can develop a plan for which ever type cockroach or pest you may have. Call Brown Exterminating today at 540-464-5900 (Staunton) or 540-946-8722 (Waynesboro) for a free inspection and quote. Do not let roaches, spiders, termites, bed bugs or any crawling, stinging or otherwise creepy insect keep you from enjoying your space at home or at your business.